What is the Wisconsin Winery Co-op? Who do we consist of? We are a dedicated group of artisan Wisconsin winemakers and vineyards who pride ourselves in producing high quality wines with many of us using Wisconsin grown grapes and fruit. This Co-op has been formed as an avenue of distribution for high quality wines produced in Wisconsin. Many of our Wisconsin wineries are growing cold climate grapes and other fruit. These grape varietal names may be new and unfamiliar to most people. We urge you to try our unique wines and discover new and exciting flavors! Cheers... Members of the Wisconsin Winery Co-op!! Take the Wisconsin Wine Tasting Tour! Please take time to visit all of our Co-op members. 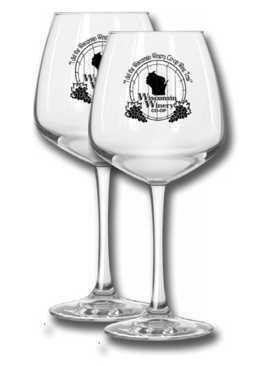 We are offering you two beautiful, stemmed wine glasses with the inscription, "I did the Wisconsin Winery Co-op Wine Trail", a real elegant souvenir for your support of our Co-op members. 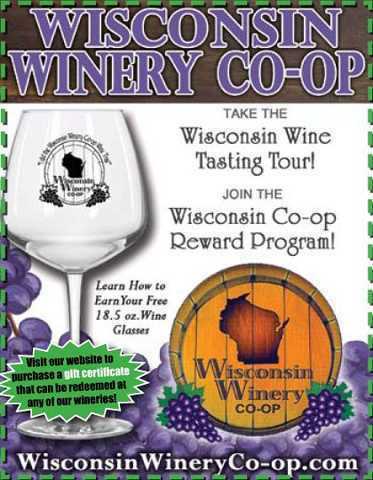 Click here for more detail on the Wisconsin Winery Co-op Reward Program. Once you have discovered the quality wines made here in Wisconsin, we ask you to look for them in your favorite beverage store. If you don't find them, please ask the store manager to carry Wisconsin Winery Co-op wines! We appreciate your support in buying locally produced products. Taste and buy some of the best wines you'll ever sample at one of our Wisconsin Winery Co-op Members. Look for the many wines our members offer at your favorite beverage or liquor store. If you are unable to find any of our members' wines - particularly at local stores near a member winery - please ask the store management to contact us so we can help them get in touch with any of our members and the many excellent wines they offer! Download our Wisconsin Winery Co-op Trail Book, or pick up a copy at any of our member wineries, for locations where you can redeem the book for TWO of our beautiful stemmed and inscribed wine glasses. Gift Certificates are now available and can be purchased here!! These Gift Certificates can be redeemed at any of our wineries! Available in $20.00 and $5.00 denominations. Page Summary: Discover Wisconsin wines online at Wisconsin Winery Co-op, with the best wine tasting and a GREAT winery tour, for one of the most fun things to do in Wisconsin! Featuring Wisconsin wineries and vineyards, along with the best wine in communities such as Green Bay, Eau Claire and Sturgeon Bay, as well as Wausau, Holmen and Onalaska, just outside of La Crosse. We also feature co-op members in Cedarburg and Port Washington , just north of Milwaukee.